Canasta (; Spanish for "basket") is a card game of the rummy family of games believed to be a variant of 500 Rum. Although many variations exist for two, three, five or six players, it is most commonly played by four in two partnerships with two standard decks of cards. Players attempt to make melds of seven cards of the same rank and "go out" by playing all cards in their hand. It is the only partnership member of the family of Rummy games to achieve the status of a classic. The game of Canasta was devised by Segundo Santos and Alberto Serrato in Montevideo, Uruguay, in 1939. In the 1940s the game quickly spread in myriad variations to Chile, Peru, Brazil and Argentina, where its rules were further refined before being introduced to the United States in 1948, where it was then referred to as the Argentine Rummy game by Ottilie H. Reilly in 1949 and Michael Scully of Coronet magazine in 1953. The game quickly became a card-craze boom in the 1950s providing a sales avalanche of card sets, card trays and books about the subject. The classic game is for four players in two partnerships. Variations exist for two and three player games wherein each plays alone, and also for a six player game in two partnerships of three. If partners are chosen they must sit opposite each other. Canasta uses two complete decks of 52 playing cards (French Deck) plus the four Jokers. All the Jokers and twos are wild cards. The initial dealer is chosen by any common method, although it should be remembered that in Canasta there is no privilege or advantage to being the dealer. Rather the true privilege is of first play and access by that player to any chance bonus card which might have been turned up, and subsequently covered, at the conclusion of the deal (e.g., if a red three or wild card had been turned up at the end of the deal, it must and would have been covered by a legitimate play card which itself could then be used by that first player in making the initial meld and taking the discard pile and thus giving that first player those bonus cards). The deal then rotates clockwise after every hand. The dealer shuffles the pack, the player to the dealer's right cuts, and the dealer deals out 11 cards to each player. The remaining cards are left in a stock in the center of the table. The top card from the stock is turned over to form the discard pile. If this first turned card is a red or black three, or a wild card, additional cards from the stock are turned over to the top of the discard pile until the top card of the discard pile is neither a three nor a wild card. If one of these bonus cards was a wild card, it freezes the discard pile until that discard pile containing the wild card has been legitimately taken into a player's hand. A bonus red three taken in this manner is not replaced by another card from the stock, as it would if it had been drawn from the stock during a player's regular turn. Any player who receives a red three in their initial hand must immediately play it to the table team and draw a new card from the stock to their hand. The player to the dealer's left has the first turn, and play then proceeds clockwise. A turn begins either by drawing the first card from the stock into the player's hand or by picking up the entire discard pile. However, there are restrictions on when one can pick up the discard pile. (See Picking up the discard pile, below.) If the card drawn from the stock is a red three, the player must play it immediately and draw another card. The player may then make as many legal melds as they wish from the cards in their hand. A turn ends when the player discards one card from their hand to the top of the discard pile. No player may "undo" a meld or laid card, or change their mind after drawing a card from the deck if they decide that they could have taken the discard pile. Each player/team keeps separate melds of the various ranks of cards. A player may never play to an opponent's meld. A legal meld consists of at least three cards of the same rank. Suits are irrelevant except that black threes are treated differently from red threes. Wild cards can be used as any rank except for threes. Threes may never be melded in ordinary play, although 3 or 4 black threes may be melded last in the process of a player going out. A meld must consist of at least two natural cards, and can never have more wild cards than natural cards (and therefore more than three wild cards). Examples: 5-5-2 and 9-9-9-2-2-Joker are legal melds. 5-2-2 is not a legal meld as it contains only one natural card. 9-9-2-2-2-Joker is not legal as it contains more wild cards than natural cards. A canasta is a meld of at least seven cards, whether natural or mixed. A natural canasta is one that comprises only cards of the same rank. A mixed canasta (or dirty canasta) is one that comprises both natural and wild cards. 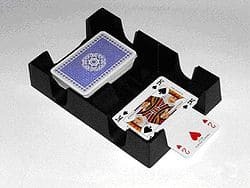 A "concealed" canasta is a canasta assembled in the player's hand and is played to the table complete, or requiring only the top card from the discard pile (the discard pile being picked up in the usual way). A concealed canasta may be natural or mixed and carries a bonus score of 100 points (so 400 for a concealed mixed canasta and 600 for a concealed natural canasta). Example: If a player/team has a score of 1,600 and has not yet made any melds in a hand, an initial meld of 6-6-6, K-K-K-2 cannot be made as it scores only 65 points and the requirement is 90. A meld of 6-6-6, A-A-A-2 would score 95 points and can be played. Note that both initial melds can be played if the team's total score is below 1500, and that neither can be played if the team's total score is 3000 or higher. At the beginning of their turn, a player may pick up the entire discard pile instead of drawing a card from the stock. They may only pick up the discard pile if they can use the top card either in an existing meld or by making a new meld along with two other cards from their hand. Only the top card is relevant for the player/team to pick up the rest of the discard pile. In addition, the player/team must meet the initial meld requirement using the top card of the discard pile in order to pick up the pile. If a wild card has previously been discarded to the pile, the discard pile is frozen. When the discard pile is frozen, it may only be thawed (picked up) if the player can meld the top card with two natural cards of the same rank in the player's hand. If a wild card or a black three is on top of the discard pile, it may not be picked up. Playing a black three does not freeze the pile, however; it just acts as a "stop card." The card discarded after a black three allows the pile to be picked up again (unless it is a wild card). A player may go out by using all the cards in their hand only if that player/team has made two or more canastas. The player may go out only by melding all his cards, and may discard a single final card if necessary. It is not required to discard a card in the process of legally going out. If the player/team has not yet made any canastas, players in that team may not make a play which would leave them with no cards in their hand at the end of their turn. The hand ends immediately when any player goes out. When considering going out, a player may ask their partner for permission to go out; however, it is not required to ask partner's permission, but if done the player must abide by the partner's answer. If the partner refuses permission, the player may not go out this turn. If the partner responds "yes", the player must go out this turn. If a player can legally go out, but has three or more black threes in his hand, these may be melded at this time only. If the stock is completely depleted when a player is required to draw a card, the hand ends immediately, that is, neither team gets the going out bonus. If a partnership has accumulated red threes, but has not yet made any melds when the opposition team goes out, then the total value of all the cards left in the player/team's hand(s) as well as the bonus value of melded red threes are subtracted from that team's previous score. That is, if a team has three red threes but had not yet made any melds, at the end of that hand the team will suffer a penalty of 300 points rather than gaining a 300 point bonus. The game ends when a player/team's total score reaches 5,000 or above. The team with the highest total score at this point wins. Canasta can be played with fewer than four players with some variations in the rules. The most significant changes are in the number of cards dealt at the beginning of the hand and the fact that each person plays individually. In a game with three players, each player receives 13 cards. In a two player game each player receives 15 cards and each player draws two cards on each of their turns and discards one. If each player draws two cards, there is usually the additional requirement that a player must have made two canastas in order to go out. This version of Canasta is widespread, especially in the United States, and it was the official tournament version used by the (possibly defunct) American Canasta Association. American Canasta can be found in few books. One notable exception is Scarne's Encyclopedia of Card Games, where the author claims to have invented a game which he calls International Canasta. Most of the elements of Modern American Canasta can be found in Scarne's International Canasta, although there are some differences. 13 cards are dealt to each player, then two face down groups of cards are dealt on either side of the draw pile and discard pile, one with four cards and one with three. The latter are referred to as the talons or wings. The discard pile itself starts out empty. The wings are never revealed, scored or otherwise permitted to affect the game in any way; their purpose seems to be to make the game less predictable by creating some uncertainty about the composition of the deck. The draw-two-cards rule is not used. Two canastas are required to go out. Play is to 8,500. Initial meld requirements are higher - 125 for teams with less than 3,000 points, 155 for teams with 3,000 or more but less than 5,000, 180 thereafter. Moreover, somewhere in your initial meld must be a matching set of three natural cards, though you are allowed to have wild cards in this meld in addition to the natural cards. The discard pile is always frozen. Many groups do not allow taking the pile and making your team's initial meld on the same turn; those that do allow this, require you to make the initial meld first, then take the pile. (The latter was the "official" tournament rule). This can be done on the strength of a pair of natural cards that were already melded that turn, or by producing such a pair from your hand after having met the initial meld requirement without it. There are some limitations on legal discards. Threes can't be discarded, except as your final discard when going out; the same is true of wild cards. If the discard pile is empty, aces and sevens can't be discarded. It is possible (though very unlikely), however, to be in a situation where you have only wild cards, or only aces, sevens and wild cards with an empty discard pile. In this case you may make such a discard (aces or sevens if possible, wild cards only if there is no other choice - never a three under any circumstances). However, an opponent may challenge the legality of such a play, in which case you must show the opponent your hand to verify that the play was in fact legal. Both red and black threes may be played to the table as red threes can in "classic" canasta. Unlike in other versions of canasta, this is optional. As in other versions, a player who plays a three draws a replacement card. Melds that do not include sevens or aces work as in "classic" canasta, except that such melds can include at most two wild cards rather than three. Melds of more than seven cards are strictly forbidden, as are duplicate melds of the same rank by the same team. This has a few strategic implications; for example, it is impossible to pick up the pile on the strength of a pair of (say) jacks in your hand if your team already has a meld of five jacks, natural or otherwise. One common exception, is to allow melds of 8 or more cards when going out. Skilled players will play a wild card on an existing canasta for the win. Sequences (such as those that define Samba, described below) are not legal melds and play no role in the normal play of American Canasta. The closest thing to a sequence that is normally allowed is one of the Special Hands, described below. Melds of sevens cannot include wild cards. A canasta of sevens is worth 2,500 points rather than the usual 500. However, if the hand ends without your team completing this canasta, your team loses 2,500 points. Retaining three or more sevens in your hand is nearly as bad, carrying a penalty of 1,500. Aces are treated the same way as sevens, with one exception. If your team's initial meld includes aces, wild cards may be added at that time; if this is done, the aces are treated like any other meld rather than being treated in the special way sevens are. Otherwise, all the same rules, including the potential penalties, apply to aces as to sevens. Melds consisting entirely of wild cards are legal, much like in the aforementioned Bolivia variant. A canasta consisting of wild cards is worth 3,000 points if it consists entirely of twos, 2,500 points if it contains all four jokers, or 2,000 points for any other combination. However, failing to complete a canasta once such a meld is made carries a 2,000 point penalty. Straight - one card of every rank, including a three (the reason you are allowed to retain threes in your hand), plus a joker. This is worth 3,000. Pairs - seven pairs, which either do not include wild cards (worth 2,500), or include twos, sevens and aces (all three must be present - this combination is worth 2,000). Garbage - Two sets of four of a kind and two sets of three of a kind, which do not include any wild cards or threes. For example, 4-4-4-4-7-7-7-9-9-9-9-J-J-J would be considered a Garbage hand. This is worth 2,000. Yet another variation on scoring threes is used. Scoring is 100 for one three of a particular colour, 300 for two, 500 for three or 1,000 for four; red threes and black threes are counted separately. This is a penalty if your team has no canastas at the end of the hand (and for this purpose threes in your hand count as though they were on the table), ignored entirely if your team has exactly one canasta, and a bonus if your team has two or more canastas. If your team has no complete canastas when the play ends, any cards that have been melded count against that team, in addition to any of the above penalties that may apply. A team with at least one canasta gets positive points for these cards as usual. Samba is a variant of Canasta, played with three decks, including jokers, for a total of 162 cards. 15 cards are dealt to each of four players, and an additional card is turned up. The game is to 10,000 points instead of 5,000. Samba allows sequence melds of three or more (for example, the 4, 5, and 6 of hearts or the Queen, King and Ace of Spades). If a player is able to make a sequence of seven (for example, the 5 through J of diamonds), this is a samba and is worth 1,500 points. Rather than four red threes being worth 800 points, six red threes are worth 1,000 points. Two wild cards is the maximum allowed for a meld. The minimum initial meld is 150 if a partnership has 7,000 or more. Bolivian Canasta is similar to Samba, as it uses three decks and sequence melds. Play is to 15,000. Wild card canastas (bolivias) count 2,500. A side must have a samba (called escalera in this game) and at least one other canasta to go out. Red threes only count positive if two or more canastas have been melded. Black threes are negative 100 instead of negative 5 when left in hand. Similar to Bolivia, but only to 10,000. The minimum meld requirements are 150 from 5,000 to 7,000; a canasta from 7,000 to 8,000; 200 from 8,000 to 9,000; and a natural canasta from 9,000 up. Wild card canastas count 2,000. Partnerships receive 1,000 for five red threes and 1,200 for all six. If a side has a sequence of five cards or less, it loses 1,000. Similar to the original rules but with the important addition of 'Acaba' (Spanish for 'The End'). A player may say this at any point during their turn and will immediately forfeit the round awarding the opposing player or team 1,500 points and receiving 0 points, ending the very dull phase where one player or team has total control over the discard deck. When playing in teams a player may ask their teammate for permission to say acaba just as they may ask before going out and they will also be bound by the response in the same way. A two-deck variant to 7,500. Requires 150 for an initial meld if a partnership is over 5,000. The deck is always frozen. Wild card canastas are worth between 2,000 and 4,000; depending on the number of deuces. Threes are scored only if canastas are made; they count 100 for one, 300 for two, 500 for three and 1,000 for four. Black threes are removed from play if a discard pile is taken; a partnership that removes all four black threes this way gets 100 points. This variation originates in Slovakia. Since the definition of Canasta rules differed from player to player a strong urge has risen for unified rules. This in turn was satisfied by the creation of Boat Canasta, which really is a mix of other known rules, but thoroughly optimized. Currently this variant of Canasta is steadily gaining popularity mainly in Slovakia, but also in countries such as France, Germany and England. This version is a quad deck game that is played with a hand and a foot, unlike traditional canasta that just has a hand. Each player is dealt two piles of 13 cards, which will be referred to as the "hand" and the "foot". The hand is picked up normally, while the foot remains face down until the hand is exhausted. A player who melds all cards from the original hand picks up the foot as a new hand and continues playing. A player who exhausts the original hand by discarding picks up the foot as a new hand, but does not play from it until the next turn. On each turn, players draw two cards from the stock. Each player discards one card on each turn. The number of canastas required to go out are three red and four black canastas. When playing a singles game (that is, without partners), the requirement is one red canasta and two black canastas. Discards may be picked up with a natural pair, but a player must take the top three cards from the discard pile. Threes may not be melded; so, since the only way to get rid of them is by discarding them one at a time, the number of threes in your hand represents a minimum number of turns before you could possibly go out. Black threes (in your hand or foot) score zero points Red threes are scored as 500 points (always against you, since they can't be melded). A player currently in their foot may choose to pass, or "float", rather than discard at the end of their turn (the rest of the turn plays as normal). This allows the player to play all but one card but still avoid going out. A player might also wish to float to avoid breaking a pair, or to avoid discarding a card that might be favorable to the opponents, or some other strategic reason. You must have a non-playable discard. You must have a minimum of three red (no wild cards) and 4 black canastas. You ask your partner for permission to go out. There is a special case where any player/team that manages to meld 7 canastas in one hand (natural or mixed) automatically gain 5000 points and thus win the game. A number of cards other than 11 may be dealt at the beginning of the game, 13 and 15 being common choices. Some groups vary the number of cards drawn inversely with the number of players. A concealed canasta occurs when a canasta is melded directly from a players hand. Usually in also going out: going out concealed which earns an extra 100 point bonus over the standard 100 point going out bonus. One variant allows melding up to three wild cards in a meld, regardless of the number of natural cards melded. Require that two canastas be played in order to go out in four-player, as well as two- and three- player. Variation on the above: Require one or both to be natural canastas. Note on the above: In most cases this prevents a 'concealed hand' from being played, but it is still possible if a player picks up the discard pile and is able to use all or all but one of the cards and meld two canastas. Consider increasing the concealed canasta bonus to 250 or 500 points to reflect the increased difficulty of such a play. When the stock is depleted, consider flipping over the discard pile and turning it into a new stock to extend play. If the stock and discard pile are both depleted, continue as if the stock were depleted under normal rules. Play with a modified deck, such as six, two, or zero jokers, or only 7 of each meldable card. For a faster-paced game that de-emphasizes the importance of picking up the discard pile, draw two cards rather than one each turn. This is especially common in two-player games. When dealing, if the dealer takes the correct amount of cards off the stock to complete the deal, and he has no cards in his hand after dealing the first card to start the discard pile, he scores a bonus of 100 points. Require that all players with less than 1,500 points meld 50, even with a negative score. Require the player behind (to the right of) the dealer cut the deck leaving the bottom separate from the top. The dealer then uses the bottom pile to deal from. If the cutter left the exact number of cards needed to deal to all players plus the one initial card for the draw pile, that team gets 100 points. When picking up the discard pile, only the top card can be used in this turn. The remaining cards picked up can then be used in subsequent turns. The expression "as dead as Canasta" cites the transience of popular interest in the game within the United States.